Formed in 1958, AS&E began as a developer of scientific instruments for NASA, founded by a group of scientists from the Massachusetts Institute of Technology (MIT). In 1959, future Nobel laureate Dr. Riccardo Giacconi joined AS&E and put together an elite X-ray astronomy team. In the coming decades, Dr. Giacconi’s team made a succession of scientific breakthroughs, including the discovery of the first known X-ray source outside the solar system (1962) and the first successful soft X-ray photograph of the sun (1965). In subsequent years, AS&E went on to develop advanced technologies in the fields of defense, education, medicine, non-destructive testing, and security, such as low energy, high-resolution Computed Tomography (CT) scanning of the human body—the same technology that is used today in medical diagnostic-scanning systems around the world (1976). In addition, AS&E also developed the first cargo X-ray imaging system used by the U.S. Government to scan rail cars leaving Russian missile factories (1989). And AS&E developed the first mobile X-ray inspection system with the MobileSearch (1994). Today, AS&E focuses on designing and manufacturing world-class inspection technologies, with expertise building on our heritage of innovation. 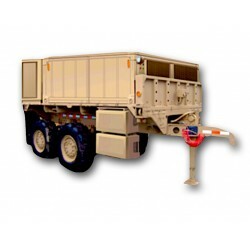 The ZBV Military Trailer Mobile Backscatter® X-Ray is the most maneuverable, versatile, and successful cargo and vehicle screening system on the market. Featuring Z Backscatter technology, pioneered and perfected by AS&E, the ZBV system can quickly reach places other systems can’t go, and scan objects other systems can’t inspect.